During my command of U.S Forces Japan and 5th Air Force, my family and I were afforded the opportunity to learn from and forge lasting bonds with our Japanese military counterparts. The US–Japan relationship is unique, and with careful nurturing will become even stronger over time. JUMP plays a pivotal role in keeping us connected. In fact, through JUMP’s well planned and executed programs, events, social media, and other tools it strengthens our knowledge of, and appreciation for, Japan, its people and its culture. General Ralph E. “Ed” Eberhart, UASF (Ret.) 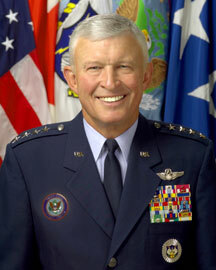 was Commander of the North American Aerospace Defense Command and the U.S. Northern Command, Peterson Air Force Base, Colorado. Over the course of his military career, General Eberhart logged over 5,000 hours as a command pilot, primarily in fighter and trainer aircraft, including 300 combat missions as a forward air controller in Vietnam. General Eberhart was awarded the Grand Cordon of the Order of the Sacred Treasure by the Emperor of Japan while serving as Commander of U.S. Forces, Japan.